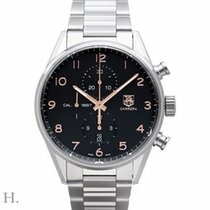 Steel Tag Heuer Carrera Chronograph Calibre 1887 Automatic CAR2014-0. 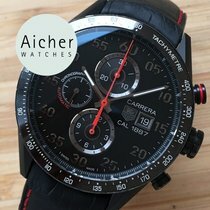 Case diameter 41mm, water resistant to 100 metres. 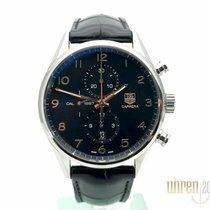 Automatic Tag Heuer Calibre 1887 movement, beats at 28,800 vph, contains 39 Jewels & has an approximate power reserve of 50 hours (40 hours with the Chronograph continuously running). 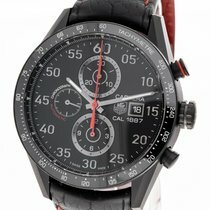 Black dial with black sub dials and Arabic numerals. 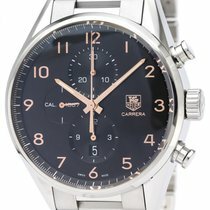 30 minute counter located at the 12 o’clock position, 12 hour counter located at the 6 o’clock position, and Small running seconds hand sub-dial located at the 9 o’clock position. See through sapphire case back. Black croc strap with steel folding clasp. Box and papers. Pre-owned UNUSED.